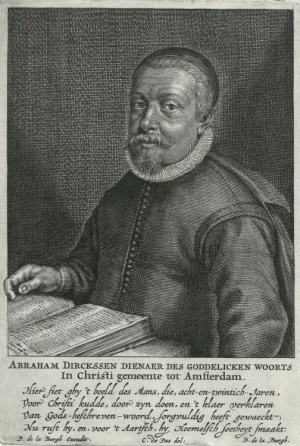 Abraham Dirks Bierens was for 28 years one of the preachers of the United Flemish Lamist congregation in Amsterdam. The dates of his birth and death are not known, but were probably 1591 and possibly August 1644 respectively. He died of a cerebral hemorrhage in the pulpit in Dordrecht at the age of 55 years. In 1646, if still living, he became the father-in-law of the famous Galenus Abrahamsz de Haan. He became a preacher in 1617. In 1626 he signed the confession which J. Outerman presented to the government. He was also one of the preachers who signed an agreement for the union of the Flemish and Frisians in 1627, to put an end to the divisions among the Mennonites. To this end the confession of faith called the Olifftacxken (Olive Branch) was compiled. A second attempt at union was made in 1630. There is a picture of Bierens and a formulary for the ordination of preachers and elders written by him in G. Maatschoen's Aanhangsel op de Geschiedenis der Mennoniten (Amsterdam, 1745). He is the progenitor of the Bierens de Haan family. Hege, Christian and Christian Neff. Mennonitisches Lexikon, 4 vols. Frankfurt & Weierhof: Hege; Karlsruhe: Schneider, 1913-1967: v. I, 219. Hoop Scheffer, Jacob Gijsbert de. Inventaris der Archiefstukken berustende bij de Vereenigde Doopsgezinde Gemeente to Amsterdam, 2 vols. Amsterdam: Uitgegeven en ten geschenke aangeboden door den Kerkeraad dier Gemeente, 1883-1884: v. I, Nos. 566, 570, 574, 599. Vos, Karel. "Bierens, Abraham Dirks (1591?-1646?)." Global Anabaptist Mennonite Encyclopedia Online. 1953. Web. 23 Apr 2019. http://gameo.org/index.php?title=Bierens,_Abraham_Dirks_(1591%3F-1646%3F)&oldid=144833. Vos, Karel. (1953). Bierens, Abraham Dirks (1591?-1646?). Global Anabaptist Mennonite Encyclopedia Online. Retrieved 23 April 2019, from http://gameo.org/index.php?title=Bierens,_Abraham_Dirks_(1591%3F-1646%3F)&oldid=144833.